Whether you’re new to loving wine, or someone who has been tasting for years, there’s always more you can learn. However, the seemingly endless pages of fine wine at nice restaurants, hundreds of ways to describe wine, and varietals changing from year to year, can make wine education intimidating. In order to handle the wine list with confidence, discover what wine qualities you like, or simply expand your taste, we have a few ideas for you. 1. Get a wine-centric group of people to form a tasting group. Find a group of individuals who have the same interest in wine and plan to get together once or twice a month to taste and discuss preferences. Try to mix up the wines you are tasting to expose your palette to as many wine varietals as possible. 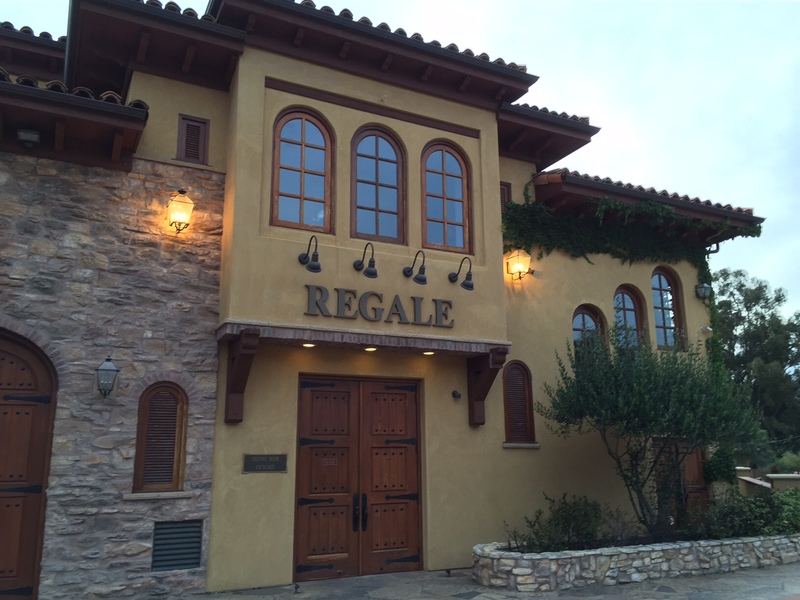 If you live near vineyards, have everyone meet at a winery’s tasting room (visit us at Regale!). The pourers will be able to enhance your depth of knowledge and bring new perspectives to your tasting group. They’ll be able to tell you more about each wine you taste, including where it was grown, how it was barreled, and how long it was aged, among other factors. 2. Find a favorite local wine bar. Get to know the staff. Become a regular. Stop by the wine bar once or twice a week for a glass of wine. Become acquainted with their menu by trying different wines each time you visit. This will help you to identify characteristics that you like and dislike in wine. 3. Host a dinner party with a themed wine selection. Pick a wine that you would like to know more about (for example, Pinot Noir). Have everyone bring a bottle of Pinot Noir so you can taste and discuss multiple bottles. To take your themed dinner party to another level, have everyone bring a Pinot Noir from a different region. This will allow you to draw comparisons between wines produced in different types of land and soils (like the Willamette Valley and the Santa Cruz Mountains). Take detailed notes to assess your preferences and compare with your guests. (Our favorite tip!) Take advantage of the resources you have around you. Find a good local wine shop and get to know the people who work there. Each time you buy wine, ask for one bottle that is full bodied and one that is light bodied. Pay attention to what the experts are doing. This will encourage you to branch out from wines you typically drink and allow you to find new wines you never knew you’d like. To increase your knowledge of wine, your best bet is to experience as much as possible. Each of these tips will help you to do so, but keep in mind that the very best way you can learn is to taste. In addition to making these tips part of your wine tasting routine, be sure to have a few good resources to reference. This will keep you on top of wine trends and ongoing education. Calwineries.com – A guide to wineries in California with information about terrain, history and more. WineSpectator.com – A leading wine resource, with information on just about anything you ever wanted to know about wine. 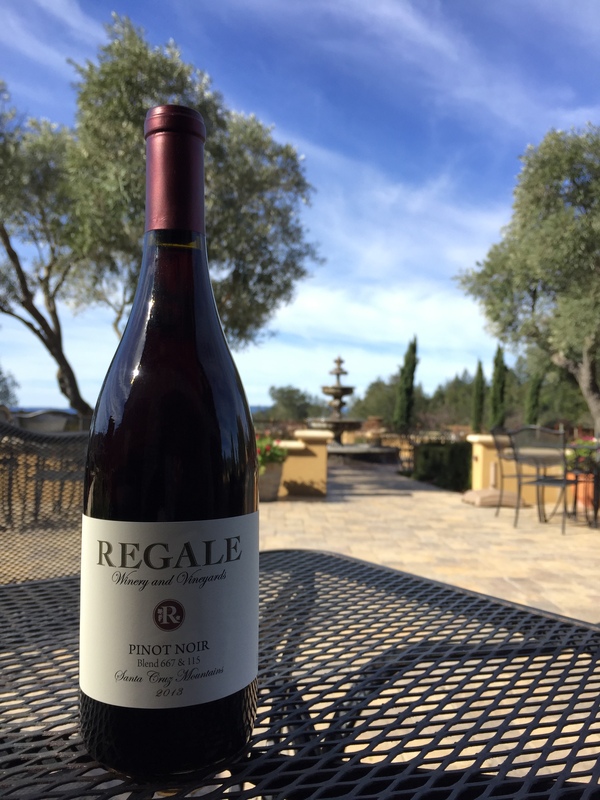 The winery celebrated our 5th Anniversary this month, with a tasting of different vintages of our Estate Pinot Noir and Chardonnay to showcase the past, present and future of Regale. It was definitely a time to reflect on how much the winery has changed over the years, and how far we have come since we began pouring tastings in the “gardens” back when it was less garden and really just more… dirt. From a wine standpoint, it was great to see the progression of our Estate Pinot Noir vineyard as we tasted the 2008 Estate Pinot Noir which was the first real production vintage, the 2012 which is our current vintage, and the 2014 straight from the barrel which will be bottled later this year. The 2008 vintage, of which we were lucky enough to have a few cases left, has aged beautifully and is definitely coming into its own – a rare treat for anyone who was able to keep from drinking it over the last five years since its release. As with people, we often see when wines age they become more of what they have always been. A mediocre wine will only stand to disappoint, while a wine with structure, complexity, and pedigree stands to become so much more. As a few people noticed in the tasting notes, only 188 cases were produced in the 2008 vintage, while in the 2012 current vintage, there were 433 cases produced. When talking about our Estate vineyard this is one of the most common questions that comes up – how much wine does our vineyard produce? While this should seem like an easy formula, it is in fact anything but. On average a vineyard can produce between 1 and 4+ tons of grapes per acre under vine. Many things affect this production level including the age of the vineyard, growing conditions, pruning style, and winemaking choices. Our Estate Pinot Noir vineyard is all hillside with 3.5 acres densely planted – about 4,000 Pinot vines in total, which are a mix of Dijon clones 115 and 777, and Pommard clone 5. 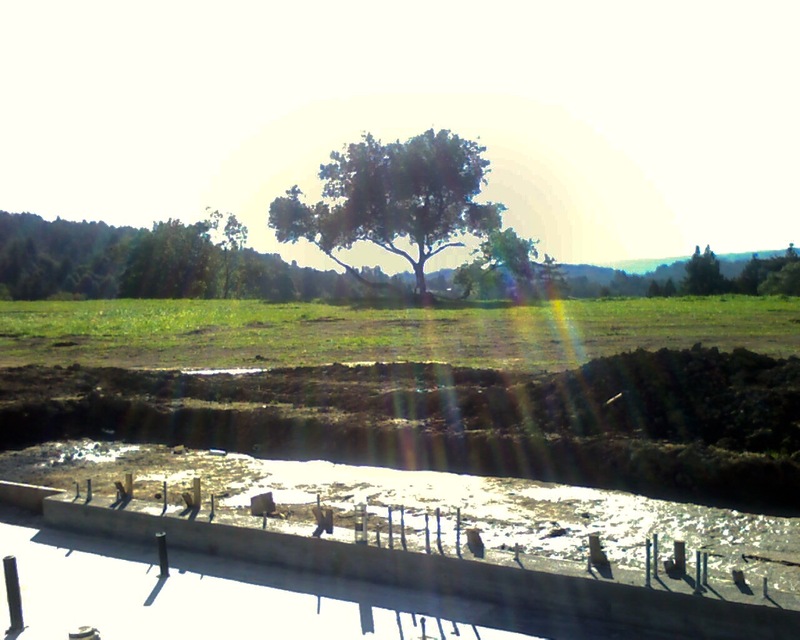 The vineyard was originally planted back in 2006 from 2 year old rootstocks which were grafted and grown in a nursery. 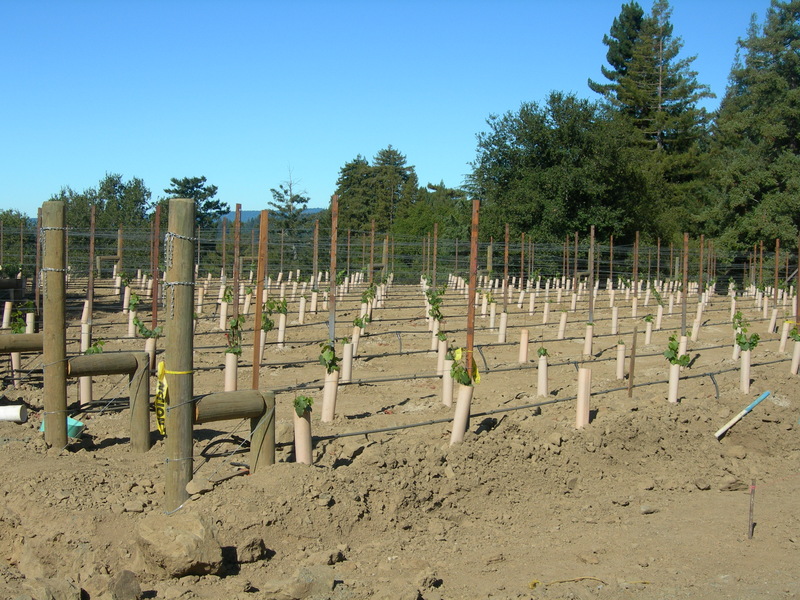 When a vineyard is first planted, the production is limited and will increase each year until the 4th or 5th harvest when the vines reach their full potential. For example in 2007 we only harvested 1 ton for the “test” vintage, while in 2008 we were up to 4 tons and since 2010 we have been at full capacity with around 12 tons per year from the 3.5 acres under vine. 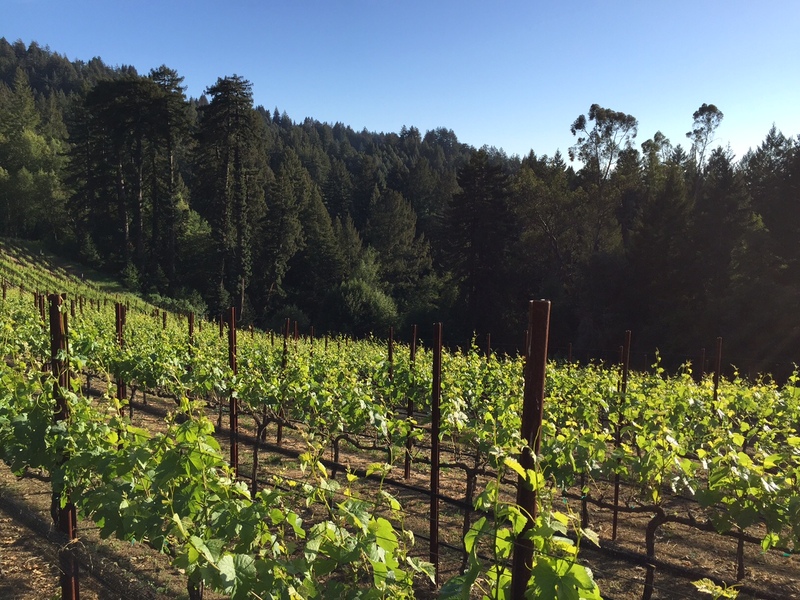 As we ponder the wines in progress, the 2013 and 2014 vintages were both stellar in the Santa Cruz Mountains, and the wines are showcasing those great growing years. 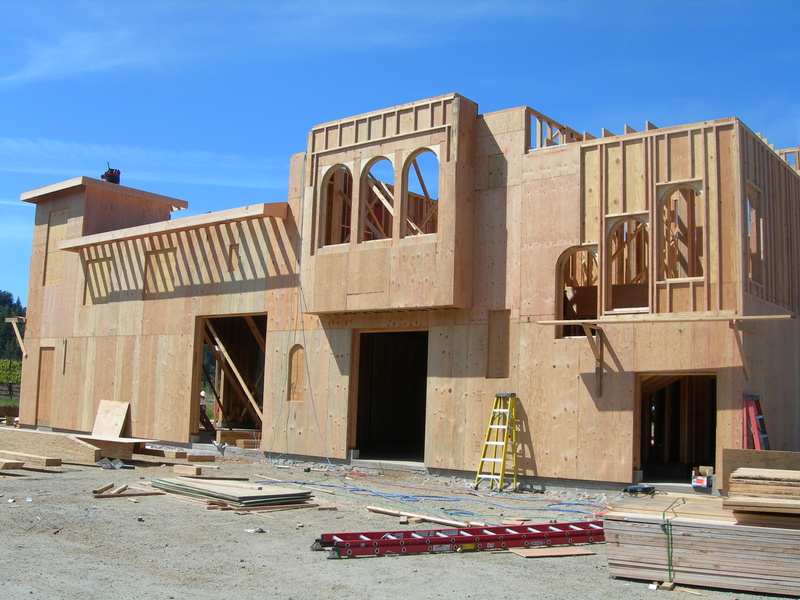 Looking at where the winery has come from and where we are headed, we could not be more excited to see what the next 5 years hold for the winery and for the wines still to come. 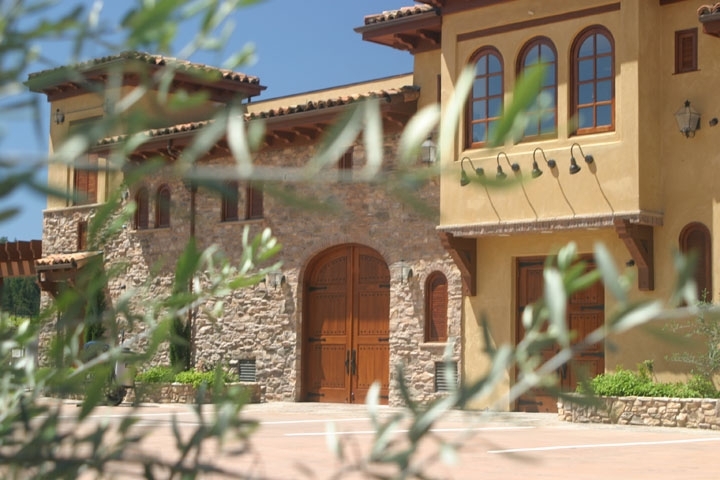 The past 5 years have brought dozens of amazing wines, an Estate vineyard at full production, a gorgeous winery building with manicured gardens, and myriad celebrations of all kinds. The fond memories are not only ours, but shared with our guests and extended Regale family who have, over the past five years, celebrated birthdays, marriage proposals, weddings, babies, and new friends while sipping a glass of Regale wine or relaxing in our gardens. So here’s to our guests- for giving us a reason to make wine, and a reason to celebrate! Our grape vines have settled in, confident t hat Spring is fully upon us, as they began the process of flowering. I am sure their roots are thankful for any errant rain storms blowing through the mountains, as their leaves have truly fleshed out, soaking up the sunny days that have been far too ever-present in this multiple year drought. 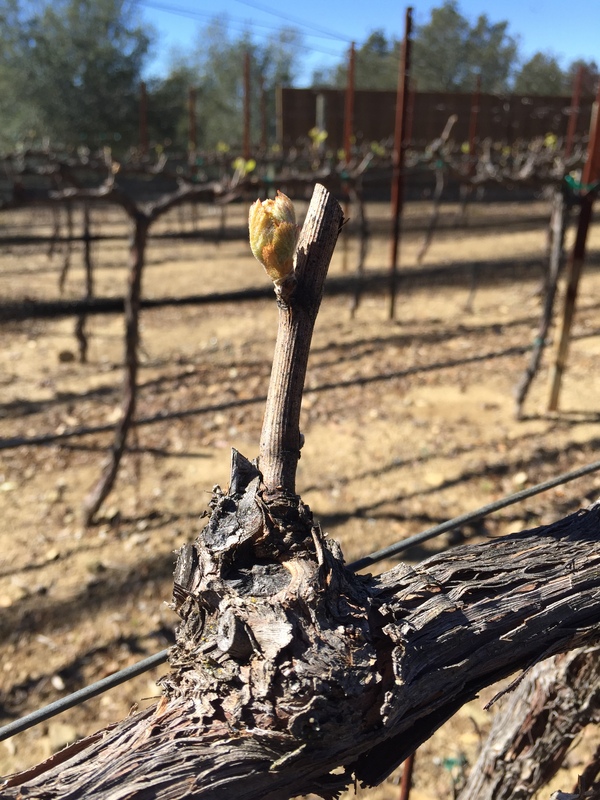 After budbreak (which was quite early this year itself), the second main stage in a grape vine’s life cycle is flowering, which typically occurs after about a month of vegetative growth. 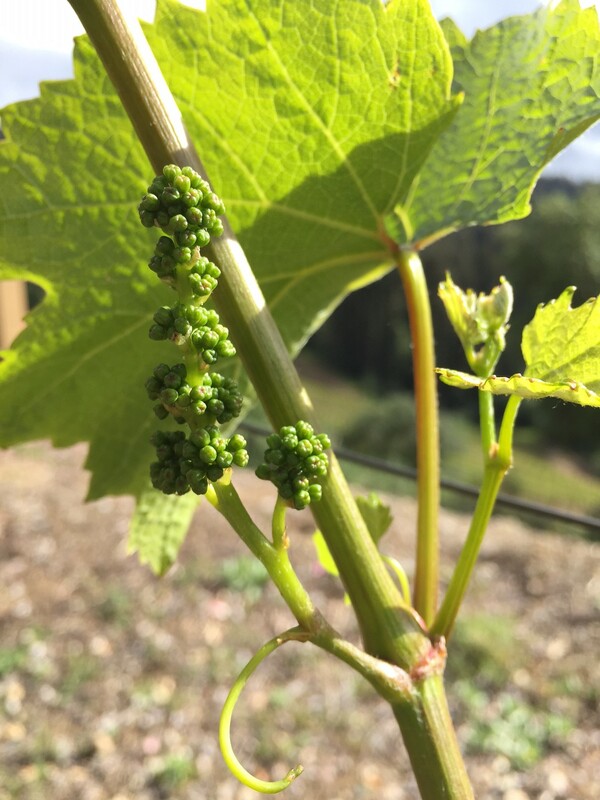 In this oddly early year, flowering began in our Estate Pinot Noir & Chardonnay vineyards in March. During flowering, vines develop tight bunches of tiny flowers, with each flower having the potential to form a single grape, together making up a cluster. During the flowering stage, there are a number of things that can damage the tender young shoots of our grape vines, from parasites to weather concerns of frost, wind, or excessive rain. As the season progresses, the grape flowers will grow, and open allowing for pollination and fertilization to follow, after which the flower transforms into a grape. Despite the early budbreak and all the concerns that come along with it, this year is still shaping up beautifully! 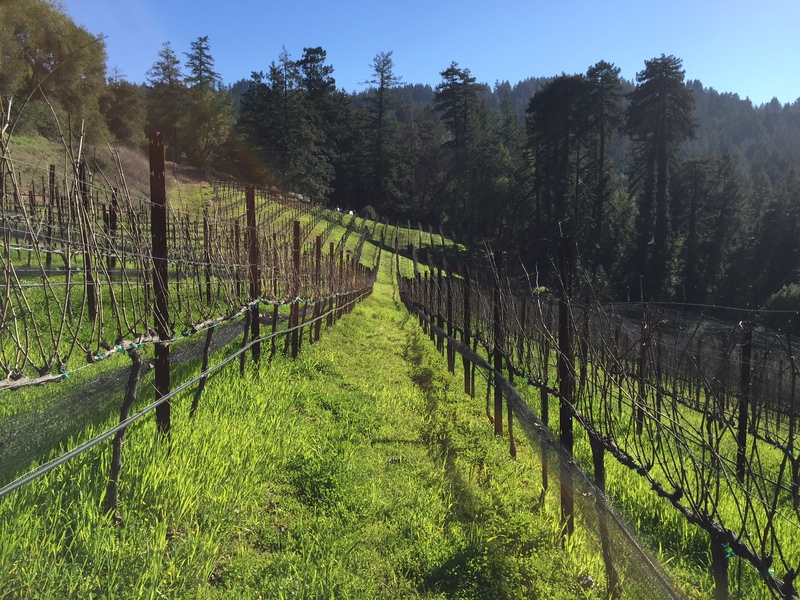 Pruning for our Estate Pinot Noir and Chardonnay vines began in late January, and finished by mid-February. While late pruning is better for disease resistance and can delay bud break, with the warm weather we have had thus far, vines are coming out of dormancy early so it was important to finish pruning expediently. 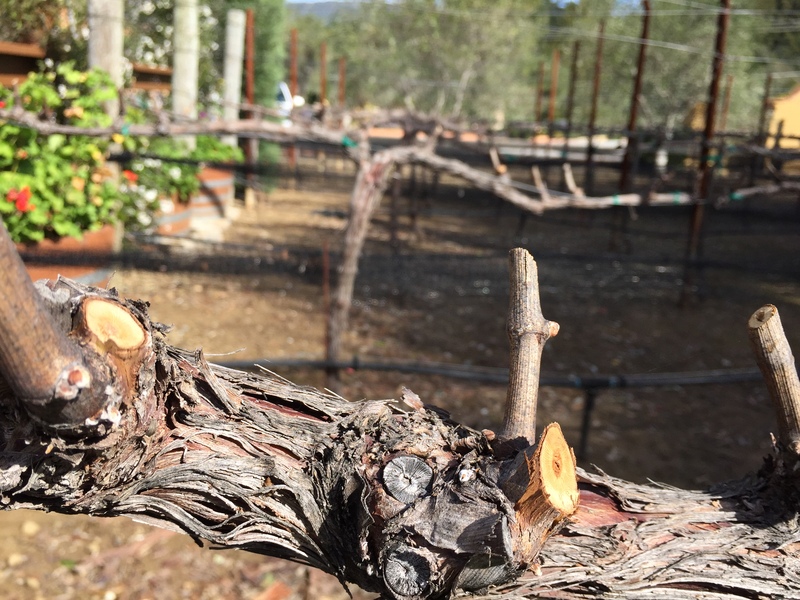 This year properly timed pruning ended up being especially important as vineyards across California are experiencing very early bud break. As many of you may know from your own backyard fruit trees, pruning is necessary to ensure the best quality of the fruit for the coming harvest. Each year grapevines produce new “canes” which will develop shoots to bear the fruit. As only one-year-old canes can bear fruit, each year we must remove older canes which no longer serve a purpose to the vine. By making the selections about where and how we prune the vine, we will be affecting everything about how the year’s crop will develop- no pressure there! Pruning is one of the great arts of grape growing that can never be mechanized due to the precision and careful selection of each cut. 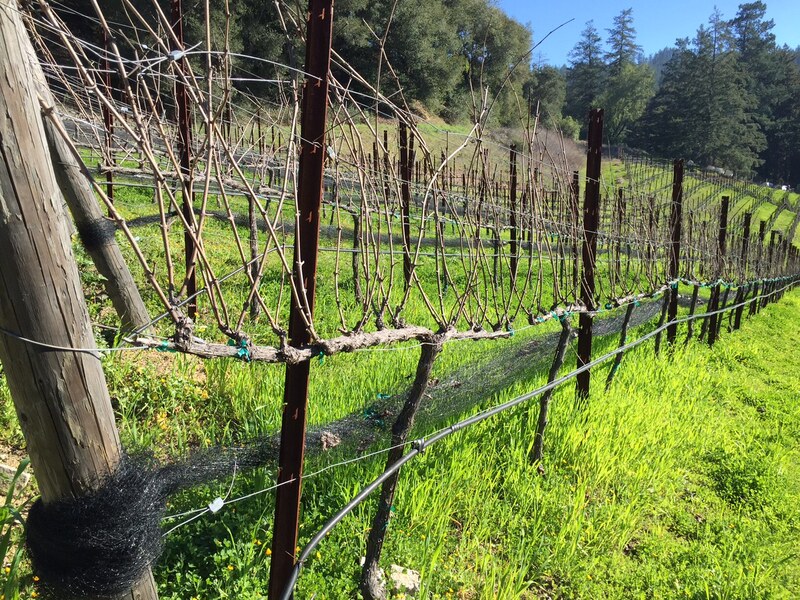 Luckily at Regale, we were fully pruned in both of our Estate vineyards before bud break! First signs of bud break come when the tiny buds on the vine start to swell, then begin to sprout shoots and eventually develop grape leaves. We always love to see some green in the vineyard, although this early in the year can be a bit nerve-wracking! 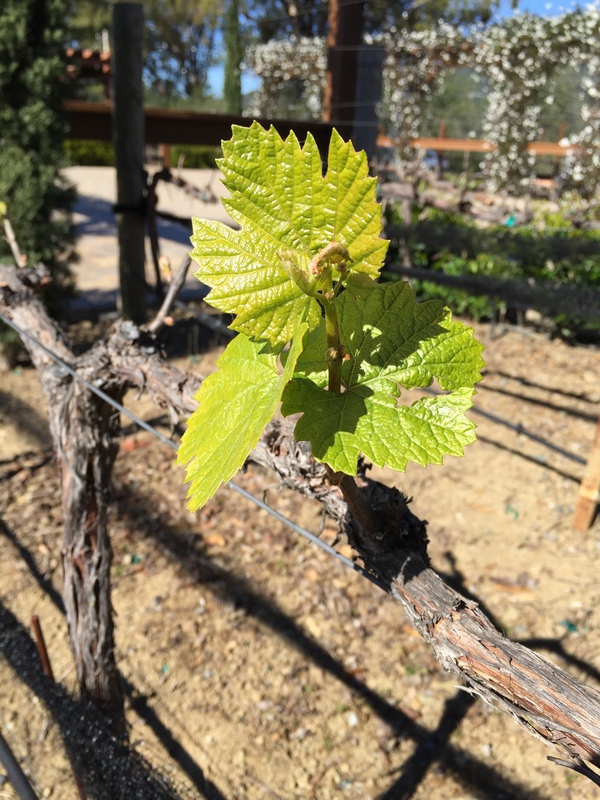 Some of our Estate Chardonnay vines in warmer spots have indeed begun to send out their leaves, as Spring is clearly upon us given the unseasonably warm and dry February we have been experiencing. 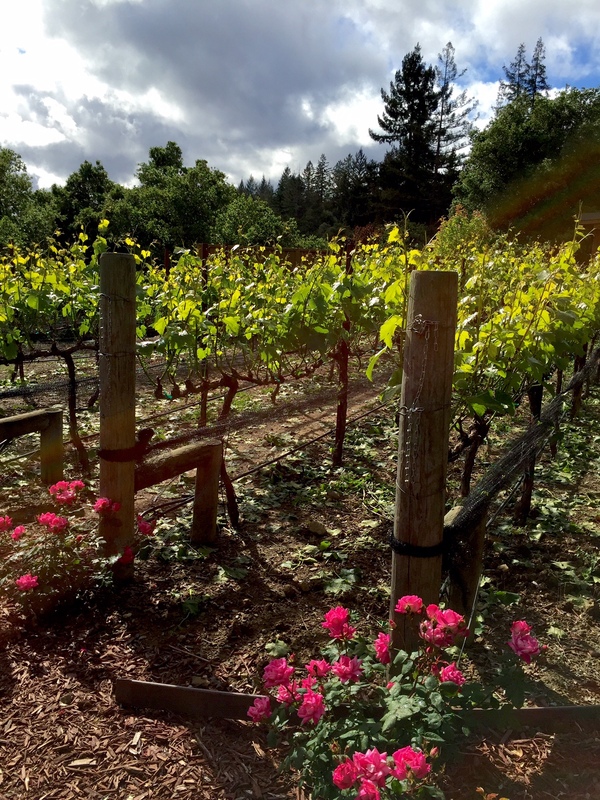 If you haven’t been up to the winery lately, now is a great time to come check out the Estate Chardonnay vineyard, as vines are visible at each stage, from swollen buds all the way to actual foliage. This past weekend we released a number of new wines, including a Pinot Noir clonal blend labeled “Blend 667 & 115” which is sourced from the Santa Cruz Mountains. What these numbers represent was a hot topic of discussion, leaning towards wine geek territory as we pondered blending preferences, planting decisions, yields, and climate worries. At the basis of this numbers question, however, is another question- what IS a clone of Pinot Noir? While many plants are grown via seed, wine vines are propagated via a cutting- that is taking a healthy “mother” vine and cutting a piece off. This cutting is then planted and grows into a new vine with identical genetic material, therefore a clone of the mother vine. While the French have identified over 1000 different clones of Pinot Noir, most of which are spontaneous mutations, certain clones have been selected and propagated via cuttings for their flavor profile, heartiness, resistance to diseases, or ripening time. With Pinot Noir, you most often hear two names associated with clones in California: Pommard and Dijon, both originating in the Burgundy region of France. A subset of Dijon, clones 667 and 115 were some of the first registered Burgundy clones in the United States along with Pinot Noir 113, 114, and 777. These arrived only in the late 1980s through Oregon State University from Dr. Raymond Bernard who was researching clonal selection at the University of Dijon in France. The technicians at Oregon State nicknamed the cuttings “Dijon Clones” after the return address on the shipment, and clearly the nickname stuck! Almost all Pinot Noirs are a blend of multiple clones, frequently 3 or more. What makes our Blend 667 & 115 so interesting is that it is a blend of just two clones, which allows for more of the characteristics of these two beauties to shine through. Dijon 115 is the most widely planted and prized clone with a balanced full bouquet, supple tannins, and well-rounded fruit and aromatic characteristics of red cherry, dusty rose petals, leather, and anise. Dijon 667 came into the United States with the second wave of clones from Bernard, and quickly became used for the structure and persistence it added to clonal blends with angular, hearty tannins, and aromas of dark red fruit, black tea, and warming Christmas spice. Our Blend 667 & 115 has a solid backbone with layers of dark Bing cherry, a hint of earthy tobacco and a smooth long finish. While light in style, there is no lack of fruit nor tannins in this wine which has even affectionately earned the moniker “sneaky” around the winery because of how quickly it seems to disappear from the glass. Sneaky makes for a good opportunity to debate clonal selection, and is quickly becoming the new staff favorite. If you haven’t been to the winery to try it yet, you should… before it all disappears in our glasses!